I frequently use the Includes-Excludes Table as a tool for clarifying the scope of a strategic initiative and its projects. 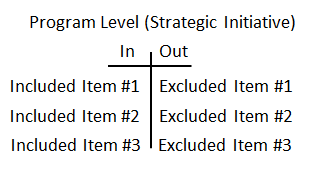 The Includes-Excludes Table is a simple two-column table with the word “in” placed at the top of the left column and “out” at the top of the right column. The nearby graphic shows a simple example that you can use as a model. It is important to consider and list are related concepts on the row of the table. For a simple example, see the nearby graphic that distinguishes that apples, dogs, and Simon are in the scope; whereas, oranges, cats, and Garfunkel are not in the scope. Note on the left side of the table, I categorized them as fruit, pets, and musicians. This is important, as we only get a good scope by understanding that the more abstract category (say, fruit) gives us a framework to understand structural and functional differences (apples have thinner skins than oranges). For another example, if we are trying to improve performance of our employees, we need to understand that performance involves learning knowledge and skill (perhaps classroom training is in scope) as well as the motivation (perhaps rewards are out of scope). As I discussed in this article, performance improvement must be considered holistically, and not just a classroom training issue. Now notice the line that separates the in from the out. The word partitioning is a good synonym for the word scope, as it implies that there is a conscious choice to categorize concepts. The word scope infers “partitioning” of things that are in and out of consideration. Failing to address project boundaries can cause all sorts of pain later in the implementation of the project. Scope creep is a frequently-heard complaint. The Includes-Excludes Table helps us to visualize scope creep as something that was determined to be “out” now has crept over the line to become “in.” Returning to the nearby graphic, imagine that oranges are no longer out of consideration, they have moved to the in column. This redefinition of scope might change the direction of the strategic initiative in terms of team makeup, timing of benefits delivery, stakeholder communications, and so forth. The advice for the strategic initiative leader is straightforward: pay attention to the partitioning of in and out. Don’t let something that is out cross the line unless you understand the impacts on the governance of the program. I selected the simple examples of apples, dogs, and Simon to help the reader understand the technique of the Includes-Excludes List. Now, let’s examine a more-nuanced example involving organizational strategy. Let’s imagine that an entrepreneur wants to develop a highly-focused marketing strategy of selling pet food and supplies. Knowing that there are many kinds of pets – and substantial competition in this space – she decides that she will sell products to dog owners and take a pass on owners of cats and other pet types. She might even decide to specialize within the dog market, maybe focusing on one breed of dogs or only on smaller purse-sized dogs. Each of these decisions is strategic in that the strategist’s choices eliminate options and force more specialization. Looking at this another way, the question a strategist considers is this: “How do I understand the characteristics of this element (size of dogs, breed, etc.) in such a way that I can manipulate the description in some way as to define what something isn’t?” This forces a more granular understanding of the situation and the choices being made, and leads to more focus (which is a desirable characteristic of strategy). This process of describing the in and out, and making choices, encourages the strategist to think about their business model in a more complete and logical way. Problem scope refers to the problems or opportunities that we are going to address and contrasts them with the ones we are not going to address. Product scope refers to the included features and functionality of a proposed solution, contrasted with features and functionality that will not be provided. Work scope refers to the work effort that will be defined, planned, and executed with the goal of producing a product that resolves the problem. Project managers would typically list this on the well know tool of a work breakdown structure. We all have heard the saying that a problem well defined is a problem half solved. Yet, my experience with strategic initiatives shows that people spend too-little time in diagnosis of the situation, and relatively too-much time in arguing over solutions. The Includes-Excludes Table can help you stay focused on root causes and core strategic problems. They key is to maintain a focus on the problem scope, and avoid the tendency to start designing solutions and implementing them. What are the problems you want to consider? What are the related problems that you don’t want to consider? This is strategy work: situational diagnosis and search for opportunity. Since organizations are complex, it is hard to partition initiatives crisply. I recommend starting with a strategic diagnosis: what is the context and what are the performance gaps? What issues and perceptions are going to affect executive and stakeholder consensus? There is an old saying, “any fool can add, it takes a genius to subtract.” Do you agree that we need to make the word scope less ambiguous, and work to grasp the strategic nuance? This entry was posted in Strategic Planning Issues for Strategic Initiatives, Strategy, Ambiguity, and Strong-Minded Thinking, Useful Practices & Management Tools and tagged ambiguity, Decision making, Includes-Excludes Table, program management, Project management, Scope creep, Strategic initiative. Bookmark the permalink. Greg, Nice article. It has timely applications for our group.